When I lived in the attic, I realized very well what the wind was. It seemed that gas is an emptiness, but it can have tremendous power and destruction. When the weather turned bad, it all started with an increase in wind power. And then I realized that it turns out that gas can strike and not weakly. The wind gusts were so strong that when they reached the roof, everyone who was inside heard a blow to the roof. Boom, boom, boom ... It became even scary, the blows were so strong ... But of course the roof withstood as it was designed for such gusts of wind and pressure created by the winds. Even if the gas is not noticeable, but it can have an impact. Most likely, ancient legends and myths about the disappearance in windy weather appeared. When the wind could pick up someone or something. In the sea stories they write: "The wind blew by the power of eight points." 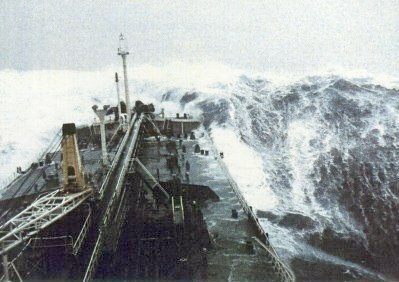 Sailors estimate the strength of the wind on a twelve point system, it is called the Beaufort scale. People can meet with the wind five times faster than a hurricane, for example, one hundred and fifty meters per second. With this speed air flows around the flying plane. From under the propellers, an indomitable iron stream strikes and keeps the heavy machine heavy. The velocity of gases in the explosion (detonation) - three thousand meters per second. During the explosion, a huge amount of heat is generated, which causes the gas to expand at an enormous speed, which in turn creates gas movement. It is faster than a hurricane. Steel rails and beams burst like icicles of ice, armor plates crumble like pieces of glass. And all this is just a gas that we cannot see and cannot touch. But that has tremendous power if it moves.